For the discerning horologophile, just how close is the upstart Rolex to presenting a serious challenge to the classic monte SPIGA MOS6170 ? 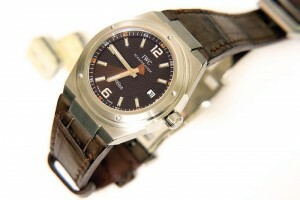 As we can see, the incumbent presents a clean, modern face and classic lines. Yes, that rehaut is indeed engraved. Could Rolex, who for those that might not have heard of the brand, are an ambitious Swiss-based outfit concerned mainly with sports marketing but branching into manufacturing, present a credible response ? 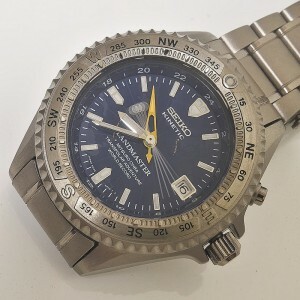 This was also called the Explorer II but it was smaller than the monte SPIGA and featured the wrong colour 24 hour hand. 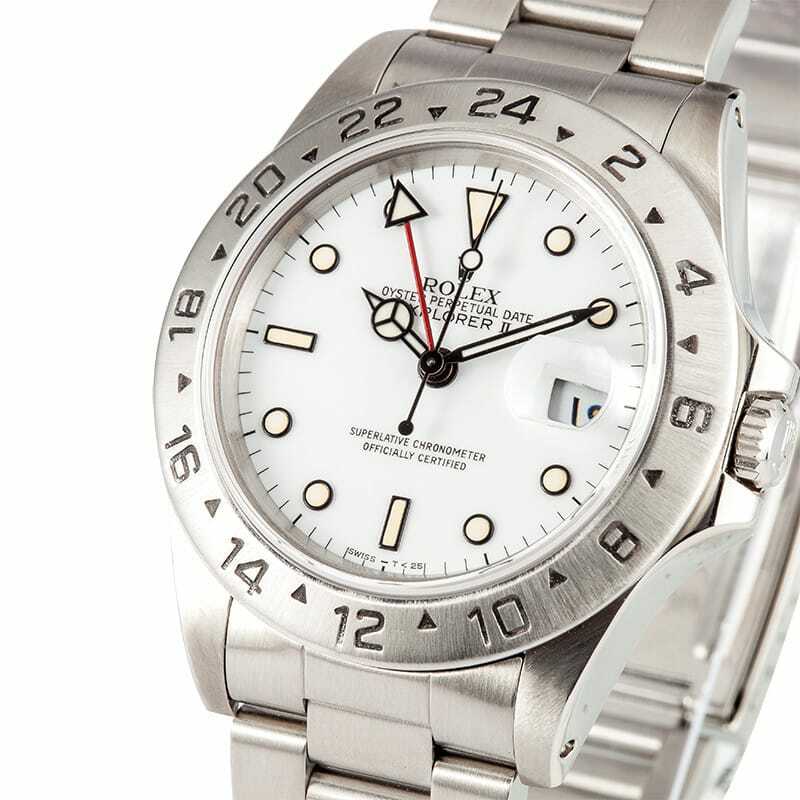 Both deficiencies have been corrected in the current Explorer II. The match is thus well truly on. Let the battle commence. Both the monte SPIGA and the Rolex Explorer II offer traditional 12-hour time and date plus an auxiliary 24 hour hand for tracking a second time zone. 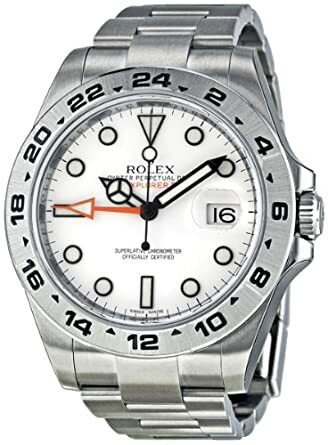 Though it should be mentioned that the very first Rolex Explorer II offered a 24 hour hand that indicated simply day or night. Rolex were reduced to marketing the watch to the spelunking community. A somewhat limited and niche sector populated by bearded people who enjoy spending their leisure time getting lost in damp caves. Later revisions, including the current one, allow the 12 hour hand to be independently set. Thus providing a more useful feature for the frequent traveller. The market was expanded to include those whose wardrobes excluded green boiler suits. 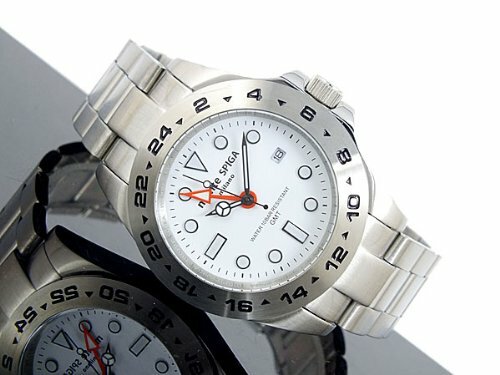 The monte SPIGA, as the with the current Rolex, offers an independently adjustable 12-hour hand. 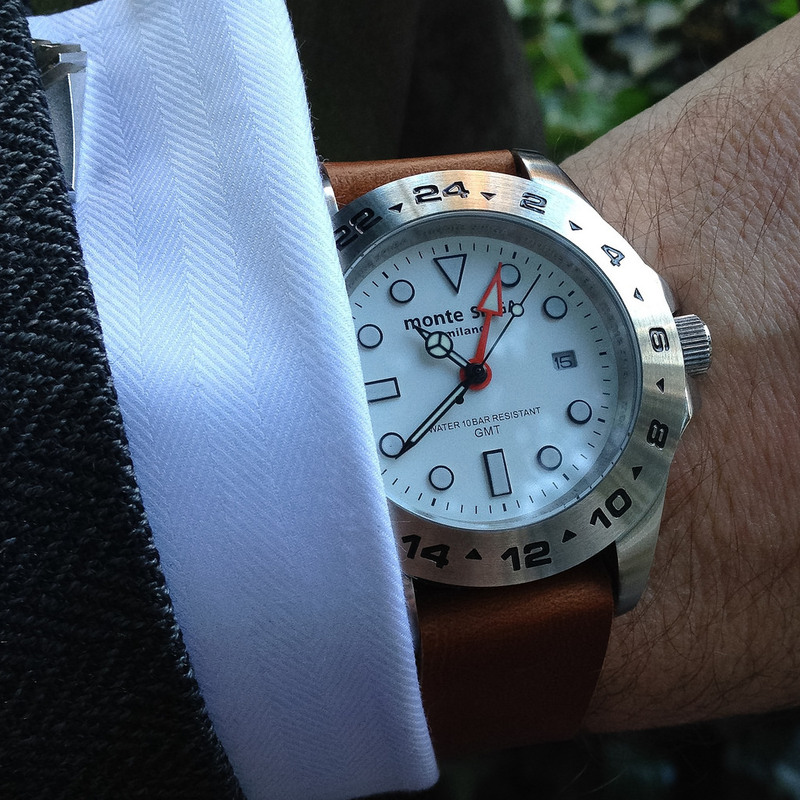 Unlike the Rolex, the monte SPIGA also offers a quickset date for ease of use. Rolex 3 points, monte SPIGA 5 points. To be fair to newcomer Rolex, it has valiantly tried to attach some history and provenance, not least in the very name “Explorer”. A reference to the claim that Sir Edmund Hillary carried a Rolex to the summit of Everest. This may be true, but he wore a Smiths watch. He certainly carried a lot of things. Including for example, a fetchingly-designed tea towel, worn as a hat. While an impressive feat of mountaineering, this does not definitively prove the tea towel has legendary endurance. Equally, Mt Everest is in Nepal bordering China, not Switzerland. The Swiss can only offer Mt Rosa, which is half the height of Everest and no one cares who climbed it first or indeed ever. Rolex might wish to reconsider this explorer association. A touch grasping. Perhaps the Rolex “Ballast” or “Backup To My Smiths” might be more appropriate. Both should be tough enough to survive all but the most feisty boardroom meetings. There are some important differentiators though. The Rolex punches hard with a sapphire crystal, the monte SPIGA parries with a “hardness glass” according to its caseback engraving. 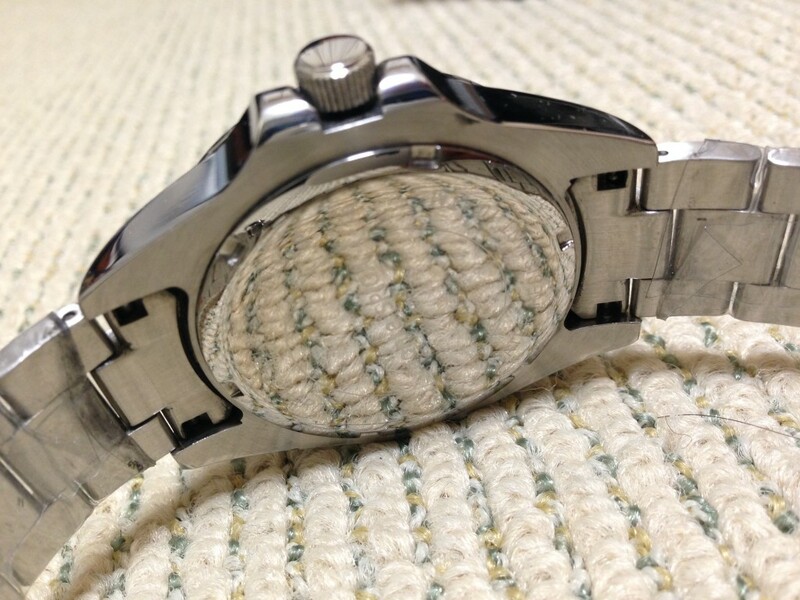 The Rolex has a screw-down crown. The monte SPIGA achieves its 100m rating without such a facility. Meaning that unlike its competitor, it is impossible to accidentally leave it unscrewed and vulnerable. It is when we look inside the watch that the real killer blow is landed. The Rolex uses a mechanical movement, powered by a spring, automatically wound by the movement of the wearer’s wrist or manually via the crown. Fully charged as such, it promises about 2 days of power and an accuracy of around 2 minutes a month. The monte SPIGA uses an electronic movement, the hands powered by a motor driven by a battery and timed using the oscillations of a quartz crystal. It offers about 2 years of power and an accuracy of around 2 minutes a year. Further research into the apparent poor performance of the challenger was conducted. According to its manufacturer, it uses all sorts of “advanced” materials and techniques but in essence, a spring is still a spring and the figures prove the point. Inside the Rolex it is as advanced as a bakelite dial phone. The monte SPIGA by contrast, is an iPhone. Those legacy Rolex gears and springs require regular maintenance to be conducted by the manufacturer, at a cost of $500 or so every 5 years. The monte SPIGA uses reliable technology, requiring a simple $5 battery change achievable by any local outlet, every 2 years. Rolex’s wilful negligence of progress, while dressing it in high-performance language, is presenting mutton as lamb. I can only assume that Rolex choose not to use a fashionable “display back” in order to hide this sorry deception from the potential purchaser. I understand that, the world being what it is and tolerance being at all-time high, there are some who profess to prefer such anachronisms. I think we can proceed in confidence knowing that they must be either perverts or the sort of chap who frequents those seedy watch forums. Probably enjoys changing his own straps, if you know what I mean. We shall move on swiftly. On Performance, we arrive at Rolex 1 point, monte SPIGA 5 points. Predictably perhaps, the monte SPIGA is challenged here. While it offers higher performance, lower running costs, more features and improved ease of use, it has arguably priced itself out of the intended market. 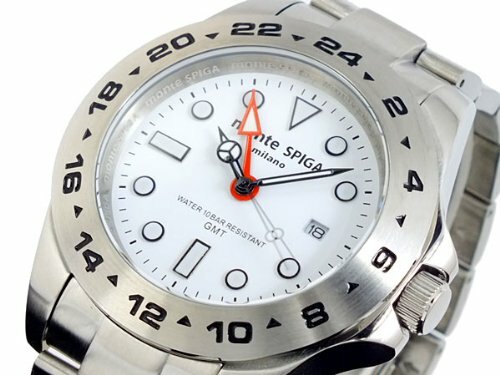 The monte SPIGA is available from dealers boxed, new, and guaranteed for a year for $60. Hang-tags and stickers included. 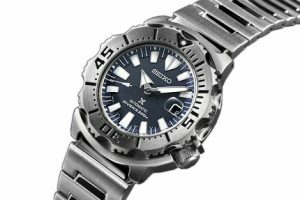 This is far beyond the reach of most luxury sports watch buyers, many of whom struggle to pay less than $1000 for a metal bracelet. Rolex are right in the sweet spot, by contrast, asking a far more reassuring $8100. It’s a devastating response to the monte SPIGA, and Rolex wins this round easily. On Value, Rolex gains 5 much needed points. The monte SPIGA strikes out with zero. Rolex should be congratulated for staying the course and improving their challenger over the years until it represents at least some serious competition. Certainly, it has aced the value proposition. Overall though, the incumbent demonstrates why it is such a reference. On total points, it scores 15 points to Rolex’s 10. Result: An easy win for the full monte.